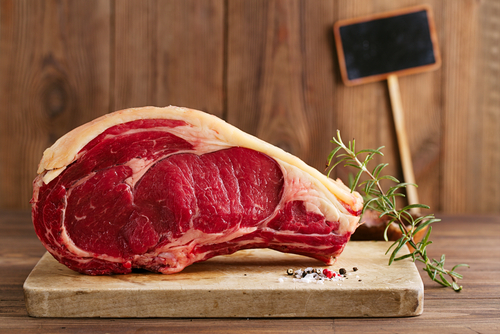 Cut from the fore rib, the wing rib or Côte de Boeuf is left on the bone and french trimmed leaving a very thick rib-eye steak bursting with flavour created by the high level of marbling. Best seared on all sides and finished in the oven on a high heat for approx. 10-15 minutes for medium rare. A perfect treat. Our cote de boeuf (wing rib) is aged on the bone for 5 weeks and more; we buy them in mid-november to ensure they are perfectly tender for Christmas. The beef is from the macduff farm in Scotland and grass fed, traditionally reared and is one of the UK’s finest beef. TOP TIP: Make the base of your gravy the day before and add to the meat juices on the day saving you much need time; you can always use the microwave!